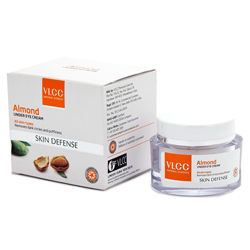 Buy VLCC Almond Under Eye Cream. Preorbital puffiness, eye bags, under eye area, helps reduce dark circles, firms and tones skin. This unique light formulation with the goodness of Almond and Wheatgerm, nourishes and moisturizes the under eye area. It helps reduce dark circles and puffiness around the eye area, firms and tones skin. The natural active ingredients, which help in reducing signs of fatigue, stress and protect your skin from harmful effects of the sun. Apply appropriate amount from the inside of the eye contour to the outside. Gently massage the eye contour area with your ring finger. Suits all skin types. Use twice a day after cleansing the face.